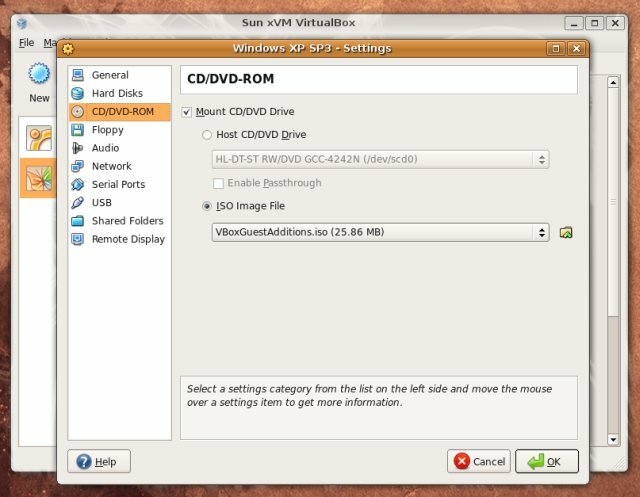 I am new to VirtualBox and to Ubuntu. I have a PC running Vista and am trying to install Ubuntu and then run NASA LINUX software. In my first try I installed VirtualBox and set up a virtual computer named Ubuntu. Then I downloaded a Ubuntu ISO file. The first time wizard couldn't find the ISO file. The Second try, I downloaded the ISO file and saved it to the desktop. The VirtualBox could no longer use the first time wizard and I couldn't find CD/DVD in the menu. Please help with some step. Just mount the Ubuntu iso file there, and restart your virtual machine. If it's still not booting from the Live CD, check the boot order of your virtual machine. How to install Ubuntu on VirtualBox? Where is the Devices menu of a Windows virtual machine?